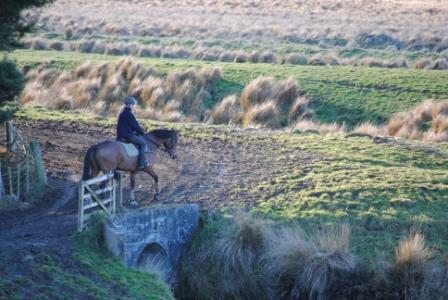 Hokonui Sport Horses is a boutique stud situated in South Otago of New Zealand. We strongly believe in quality not quantity and the superiority of our horses reflects this. We primarily breed and sell young horses, with a small number being retained for competition purposes. The stud is part of a 6100 acre (2470 hectare) agri-mix farm that also runs sheep, beef and grows grain. The farm consists of flat pastures, rolling hills and tussock country, making it the ideal setting for young horses.They grow up surefooted and confident in crossing streams, bridges and around heavy machinery which produces quiet, safe and responsible horses. Our focus at Hokonui Sport Horses is on the mare. The mare accounts for at least 50% (and some believe up to 70%) of the progenys genetics, abilities and talents. Our mares therefore are handpicked and specially selected for their temperament, movement, talents, type, conformation, and athleticism. A strong emphasis is placed on choosing mares with great families, mares that have already proven their ability to produce top class horses. There are some New Zealand bred mares and two imported holsteiner mares from Germany. We chose to import these holsteiner mares after careful deliberation and research into the different breeds and types of horses that are competing in Grand Prix and international classes. This research undoubtedly shows that holsteiner horses are at the top! For example at the 2008 Olympics 51% of the horses competing and making it through to the individual finals were holsteiners or sired by holsteiner stallions! Of the 16 top stallions of the competition an incredible 13 were holsteiners!! This undoubtedly proves the holsteiners ability to improve other breeds, and pass on their jumping talent. 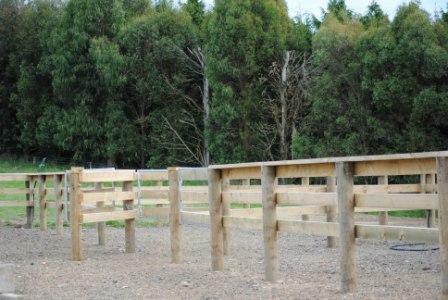 Our facilities include a foaling paddock close to the house, two large looseboxes, a 60 m x 40m all weather arena including lights and jumps and 3 large yards 6 m x 12 m. Recently we have adapted the under cover yards to accomodate horses, lining the sides with ply and raising them to accomodate the horses safely. Picture of Acolade and Caddon showing the raised ply sides of the undercover yards. 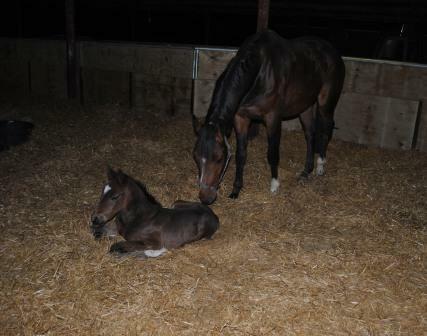 All the foals are handled, taught to led, tie up and pick up feet within the first few weeks of life. This allows the foals to learn what is expected of them, and is expanded on as they develop. Every six weeks feet are trimmed and they are all drenched. Teeth are first checked and treated when they reach two years of age. All the horses on the stud are covered in cold weather and hard fed. This level of care is maintained throughout their time at Hokonui Sport Horses.